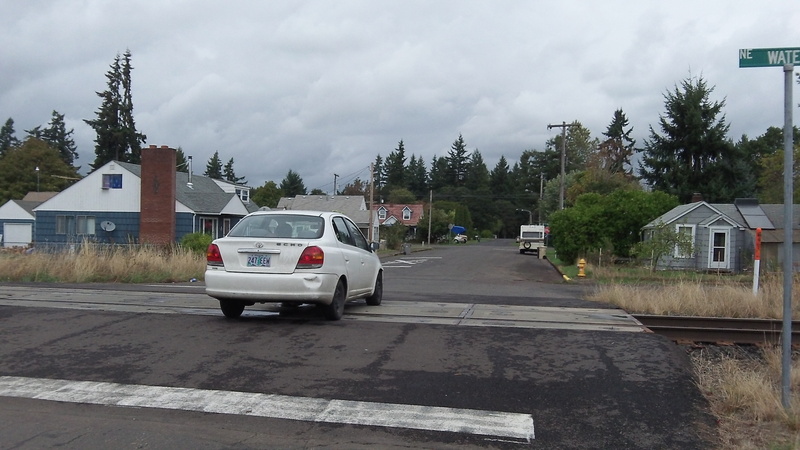 This Burkhart Street crossing of the Portland & Western’s old OE track, leased from the BNSF, will remain open. The old Oregon Electric freight rail line from Albany south is a sleepy track. Usually there’s one train in the morning and one going the other way late in the day. In the Albany neighborhood east of Geary Street, the line crosses several streets, also with very little traffic. Considering the low speed of trains and good sight lines, car-rail crashes there seem unlikely, but ODOT would like some of the crossings closed. In 2008 the council and ODOT made a deal. ODOT would pay for crossing gates for the Wheelhouse building on Jackson Street, and on Hill Street later, if other crossings were closed. The Chicago and Jefferson Street crossings were blocked some time after that. In a work session on Monday, the city council faced the choice of closing the crossings on either Burkhart or Columbus Street, or postponing the decision. The council decided for closing Columbus right away and leaving Burkhart open. This clears the way for ODOT to allow construction of the first phase of the Edgewater development along Main Street, just north of the track.